Ref: Cibils_cat - free shipping above 40€, WORLDWIDE only if under 50 gr. not all printers have not been included. i have not the time to photograph all, so just to give an impression of what is edited, and what is available in our shop, by mail or at a collectors fair. 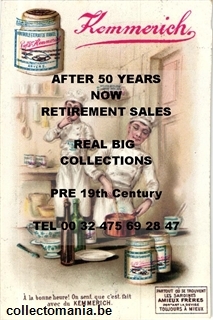 The catalogue is just an impression to persuade the collector to take contact. And so finaly complete the collection of father or grandfather with the cards absent for more than 100 years. This is the time to complete because I wont live forever. Om de kollektie van grootvader of overgrootvader aan te vullen met de prenten die hem reeds 100 jaar ontbreken. Catalogue avec prix et foto's. Quelques imprimeurs manquent encore, mais je n'ai pas le temps pour faire tous. C'est seulement pour vous donner une idée de la collection et la preuve que c'est la peine pour me rencontrer soit au magasin, soit à une bourse, soit par correspondence. Je peux vous compléter avec les chromos que manquent dans la collection du collectioneur original ( père, grand père ) pendant 100 années ! diese website is nur om zu schauen dazs Sie bei mir die Karten kaufen koenen die schon 100 Jahr in Ihre Groszvaters Sammlung misschen. Nur 2 Drücker sind nog nicht fotografiert aber ich habe nicht alle Zeit dafür, est ist schon genug. In 1881, Jaime Cibils Buxareo worked in Descalvados in Brasil in a meat extract factory in 1889 the factory was bougth by some investor from Antwerpy and begin the "Compagnie des Produits Cibils" and the chief was François Van Dionant a belgian. By this time they kill as much as 30 000 cattles by year ( ! ) People say that this was a tentative to create a Belgian colony in west Brazil and Bolivian. Some reserchers tell there was a interesse in latex plantations on the area. Em 1912, it was bougth by the american investor Percival Farquhar (1864-1953) and his Brazil Land, Cattle and Packing Company In 1940 the brazilian government nationalized the enterprises and Descalvados end operations a couple of years late.